Iñaki is a software engineer focused in mobility. He has been developing for Android from early versions and enjoy coding with a wide range of Android frameworks, libraries and applications. He moves from Mallorca to Barcelona to work with android developing banks apps and focused in personal projects with tourism apps. From one year ago he is relocated in Ireland. 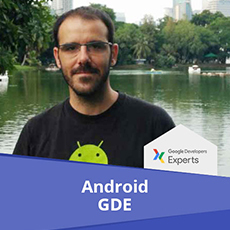 He’s actively involved in the Android community, he began as a member of the GTUG/GDG Barcelona and then he co-created the GDG Mallorca. After he moved to Ireland he is an active member of GDG Dublin. From the Android Developer Perspective we can build quick MVP with Firebase, but what if we can share our Kotlin code with Server side through another Google service like App Engine? Multiplatform projects are a new experimental feature in Kotlin 1.2. But we can start building and sharing our business logic between different layers. In this talk we will see how we can deploy on the server side and get the client side synced with our common business logic.